Home > Teeth Whitening > Can you whiten your teeth with braces on? Can you whiten your teeth with braces on? Choose the one that’s most appropriate to you, and be sure to check out our teeth whitening hub page for further information. If you’ve got any questions, feel free to ask in the comments and one of our team will get back to you shortly. Wearing braces can certainly straighten your teeth, but oral hygiene can be impeded whilst wearing them and therefore the braces process often leaves teeth stained and yellow. However, good oral hygiene using interdental cleaning and regular visits to the hygienist during your braces treatment can help to minimise staining. Using a whitening toothpaste and refraining from activities, food and drinks that stain teeth can also help. If you do notice that stains have started to occur whilst you are wearing your braces, it is usually recommended to wait until after you have finished your brace treatment before you start tooth whitening. Wearing braces can make your teeth feel sensitive due to movement of teeth, and one of the possible side effects of tooth whitening is increased tooth sensitivity, so the two combined could be even more painful. If you have fixed braces you will definitely not be able to white teeth during your brace treatment as the brackets will impede the whitening gel reaching all surfaces of the tooth evenly, creating a patchy effect. You will have to wait until after you have your brace off to whiten your teeth. If you are wearing clear aligner type braces with no attachments on the teeth it is possible to whiten your teeth towards the end of the treatment by placing the whitening gel inside your aligners. But before doing this you should always consult your treating dental practitioner to take their advice on whether or not this is recommended for you. If you’ve now completed your treatment and had your braces removed, your dental practitioner is the best person to consult about tooth whitening — they know the history of your treatment the best and can advise accordingly. In most instances, our recommendation is to opt for professional whitening instead of products you can buy online or in store, so speak to your dentist about this. If you would like to do some research before speaking to your dentist, check out our teeth whitening hub page, and especially read our article on safe teeth whitening before you go ahead with anything. Chhaya is a general family dentist based in Essex. 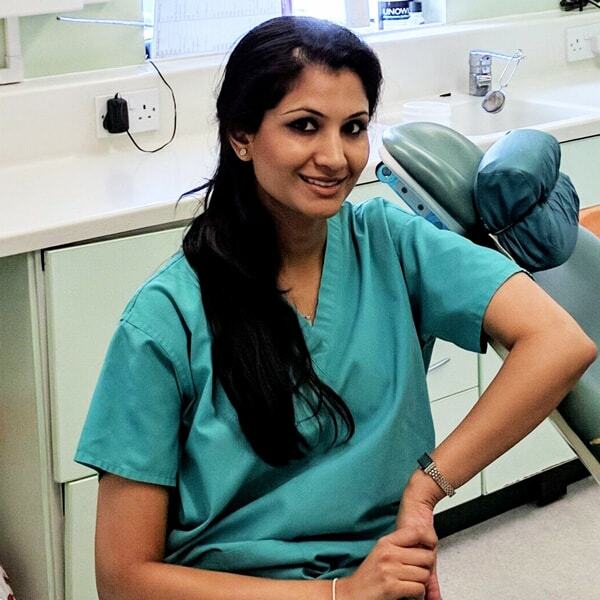 She graduated from Barts and The London school of Medicine and Dentistry in 2004 and completed her vocational training year in Peterborough. Since graduating she has completed her diploma exams and was awarded the MJDF from the prestigious Royal College of Surgeons in London. Select an option below to be notified via email about new comments on this post. Information provided on this website is not intended as dental / medical advice.